Rent scooters and cars in Alonissos. Bus. Excursion boat. Alonissos is a small island that is best discovered with a rented vehicle, the roads are in good condition and the traffic is minimal. If you are unable to go around by a rented vehicle, there are bus and taxi services available. The stretch of road between Patitiri and Gerakas in the north is the island's most beautiful distance. The view over the sea and the islands in the mini archipelago is marvellous. Gerakas itself is not much to brag about, but it is the pathway which is worth our while. Previously there was a centre of monk seals in Gerakas, the building is still there, but there is no activity. However, here is a small cantina selling simple meals and drinks. 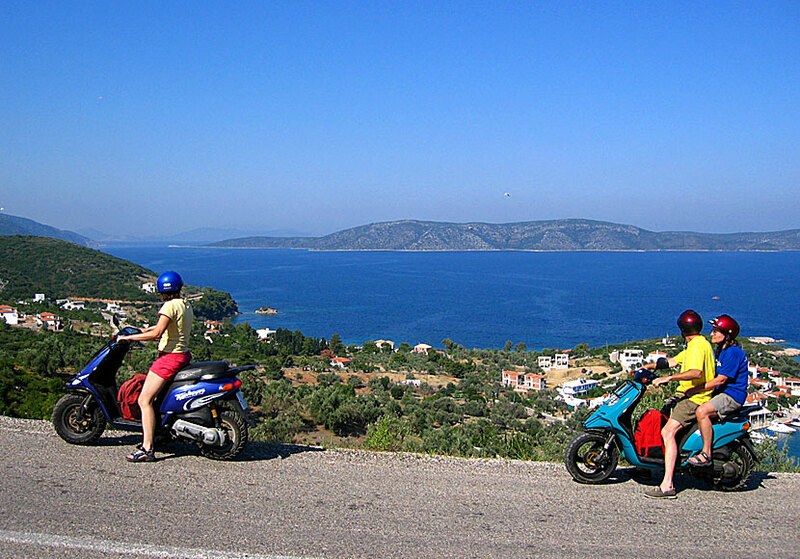 To discover Alonissos by scooter is a great pleasure. With a rented vehicle it is possible to go to all villages and to most of the island's beaches, the main roads are paved, it is only the absolute smallest roads that is surfaced with gravel. Car, scooter, motorcycle and bicycle hire places are in Patitiri. The bus runs between Patitiri and Chora up to 15 times per day depending on the season, the trip takes about ten minutes and costs around € 2. The communications between Patitiri and Stena Vala is poorer: one departure in the morning, one in the afternoon and one in the evening, the trip takes just under 30 minutes. The bus station in Patitiri lies on the big pier, where the port police has its office. If you do not want to wait for the bus, or if you are going on a hike, you can take a taxi. The taxi station is located to the right of the big pier. Every morning in good weather there is an opportunity to come along with one of the excursion boats to The Marine National Park. I can highly recommend the beautiful boat Gorgona owned by friendly Pakis. He is both captain and guide. On tour in the Marine National Park. The day begins with a short stop at the blue grotto (which is not particularly blue), and then continues to the island of Kyra Panagia. Pakis guides about the Sporades and in particular about Alonissos and the islands of The Marine National Park during the voyage. Gorgona berth in a beautiful bay at Kyra Panagia, from there it is a short walk (52 steps and five minutes along a path) up to the monastery (about 950 BC) with the same name as the island. 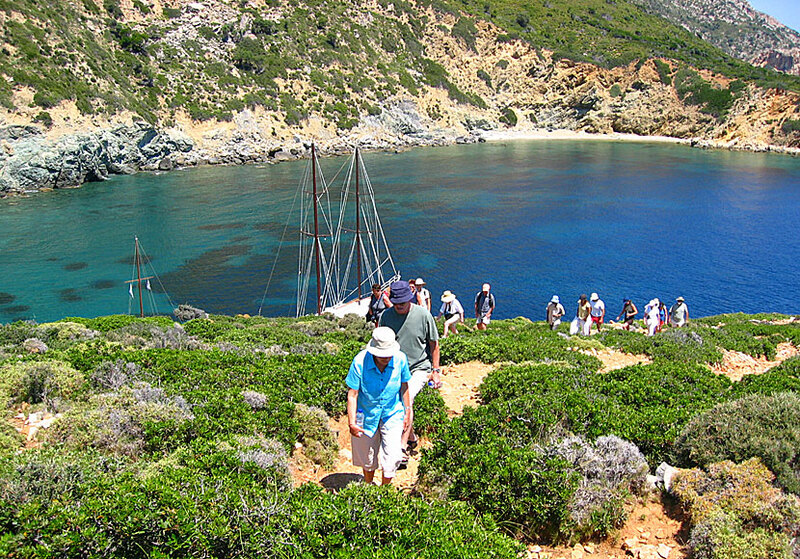 Kyra Panagia in the Marine National Park. Pakis will give you a guided tour in the monastery. If you are lucky you might meet some of the three monks in the monastery. If you are even more lucky you might see dolphins during the boat trip, and maybe you'll see other interesting animals, some of them unique: including wild goats and a rare gull (Audouin's gull). After the visit at the monastery it is lunchtime on board the boat. On the trip back to Alonissos it will be one more stop at another place, either for a swim or for a cup of coffee in one of the smaller coastal villages. Tickets for the excursion is sold at the travel agency of Ikos Travel at the waterfront in Patitiri. 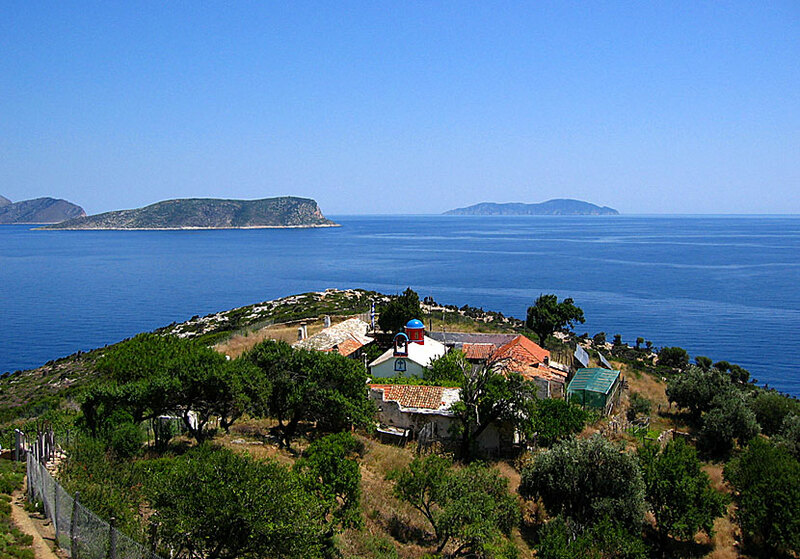 Alonissos is good hiking island, So if you like to hike you will love Alonissos.